This is another short story I came across on a rather different theme. Like the romantic short story, this piece is also centres around Fermat’s Last Theorem. 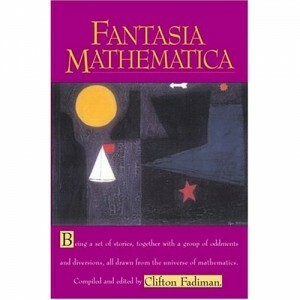 It is published within a collection of short stories entitled, Fantasia Mathematica. The Devil is a great one for riddle games. Sometimes he will appear and, without even making a decent offer for your soul, he will start asking you questions, and if you cannot answer them he will carry you off. Quoth the false knight on the road. Quoth the wee boy, and still he stood. Another situation is the converse of this: the mortal is let off if he can ask the Devil a question he cannot answer, or set him a task he cannot perform. After several months of the most arduous research, involving the study of countless faded manuscripts, Simon Flagg succeeded – in summoning the devil. As a competent medievalist, his wife had proved invaluable. A mere mathematician himself, he was hardly equipped to decipher Latin holographs, particularly when complicated by rare terms from tenth-century demonology, so it was fortunate that she had a flair for such documents. The preliminary skirmishing over, Simon and the devil settled down to bargain in earnest. The devil was sulky, for Simon had scornfully declined several of his most dependable gambits, easily spotting the deadly barb concealed in each tempting bait. The devil irritably twirled his tail-tip with one hand, much as a man might toy with his key chain. Obviously, he felt injured. The devil scowled, pulling his forked tail petulantly. Finally, a savage tug having brought a grimace of pain, he desisted. “Sorry,” he said flatly. “I deal only in souls. There is no shortage of slaves. The amount of free, wholehearted service I receive from humans would amaze you. However, here’s what I’ll do. 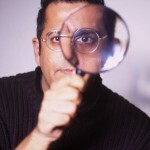 If I can’t answer your question in the given time, you will receive not a paltry $I00,000, but any sum within reason. In addition, I offer health and happiness as long as you live. If I do answer it – well, you know the consequences. That’s the very best I can offer.” He pulled a lighted cigar from the air and puffed in watchful silence. Simon stared without seeing. Little moist patches sprang out upon his forehead. Deep in his heart he had known what the devil’s only terms would be. Then his jaw muscles knotted. He would stake his soul that nobody-man, beast, or devil-could answer this question in twenty-four hours. The devil nodded. He removed the cigar stub from his mouth, eyed it distastefully, and touched it with a taloned forefinger. Instantly it became a large pink mint, which he sucked with noisy relish. “My question is just that – not a paradox,” Simon assured him. “Nothing,” Simon replied, composing his face. “You needn’t make any tests,” Simon said hastily. He took the proffered contract, and satisfied that all was in order, opened his pocket-knife. Simon hesitated, staring at the moist red tip. “Sign,” urged the devil, and squaring his shoulders, Simon did so. The devil gulped. For the first time his air of assurance weakened. “Whose last what?” he asked in a hollow voice. “I never drink on duty. Nor have I time to make the acquaintance of your wife … now.” He vanished. The moment he left, Simon’s wife entered. “Listening at the door again?” Simon chided her, without resentment. “Uh huh.” She adjusted his tie. “Of course.” Simon’s wife always understood mathematical statements, however abstruse. Otherwise, the explanation was repeated until she did, which left little time for other activities. “I’ll make us some coffee,” she said, and escaped. Four hours later as they sat together listening to Brahms’ Third, the devil reappeared. “I’ve already learned the fundamentals of algebra, trigonometry, and plane geometry!” he announced triumphantly. “With a groan the devil faded out like an old movie. Simon’s wife giggled. “Will I need all those?” the devil moaned. He sat down and knuckled his puffy eyelids, smothering a yawn. “I couldn’t say,” Simon replied, his voice expressionless. ‘*But people have tried practically every kind of math there is on that ‘little puzzle,’ and it’s still unsolved. Now, I suggest -” But the devil was in no mood for advice from Simon. This time he even made a sloppy disappearance while sitting down. “I think he’s tired,” Mrs. Flagg said. “Poor devil.” There was no discernible sympathy in her tones. It was the following afternoon. Bach seemed appropriate somehow, so they had Landowska on. There was a hiss. Rosy clouds mushroomed sulphurously. The devil stood before them, steaming noisomely on the rug. His shoulders sagged; his eyes were bloodshot; and a taloned paw, still clutching a sheaf of papers, shook violently from fatigue or nerves. Silently, with a kind of seething dignity, he flung the papers to the floor, where he trampled them viciously with his cloven hoofs. Gradually then, his tense figure relaxed, and a wry smile twisted his mouth. “You win, Simon,” he said, almost in a whisper, eyeing him with ungrudging respect. “Not even I can learn enough mathematics in such a short time for so difficult a problem. The more I got into it, the worse it became. Non-unique factoring, ideals-Baa!! Do you know,” he confided, “not even the best mathematicians on other planets-all far ahead of yours-have solved it? Why, there’s a chap on Saturn-he looks something like a mushroom on stilts-who solves partial differential equations mentally; and even he’s given up.” The devil sighed. “Farewell.” He dislimned with a kind of weary precision. Simon kissed his wife-hard. A long while later she stirred in his arms. “Nothing except I’d like to see his work; to know how close he came. I’ve wrestled with that problem for-” He broke off amazed as the devil flashed back. Satan seemed oddly embarrassed. “I forgot,” he mumbled. “I need to-ah!” He stooped for the scattered papers, gathering and smoothing them tenderly. “It certainly gets you,” he said, avoiding Simon’s gaze. He saw the blazing interest in Simon, and dropped his apologetic air. “Say,” he grunted, “you’ve worked on this, I’m sure. Did you try continued fractions? Fermat must have used them, and-move over a minute, please-” This last to Mrs. Flagg. He sat down beside Simon, tucked his tail under, and pointed to a jungle of symbols. Mrs. Flagg sighed. Suddenly the devil seemed a familiar figure, little different from old Professor Atkins, her husband’s colleague at the university. Any time two mathematicians got together on a tantalizing problem … Resignedly she left the room, coffee pot in hand. There was certainly a long session in sight. She knew. After all, she was a professor’s wife.